I was asked to design a rosary using blue and clear beads. 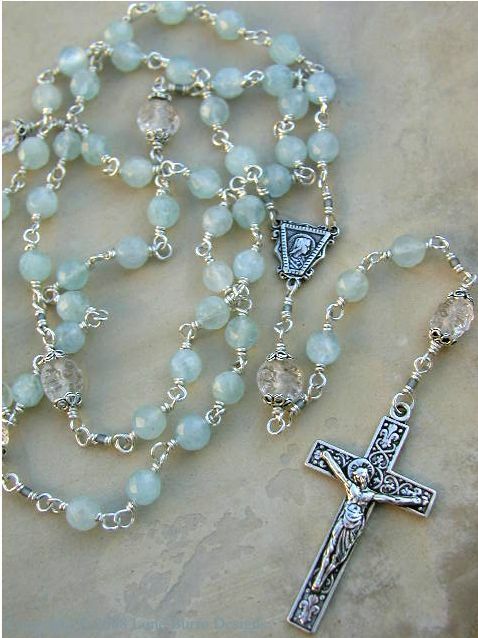 What resulted was this simple, elegant rosary of 6mm faceted aquamarine, paired with pressed glass beads in a flower motif. This was a commission piece for a customer. It is designed to fit easily in a purse of pocket, but is large enough that it is not lost in the hand. 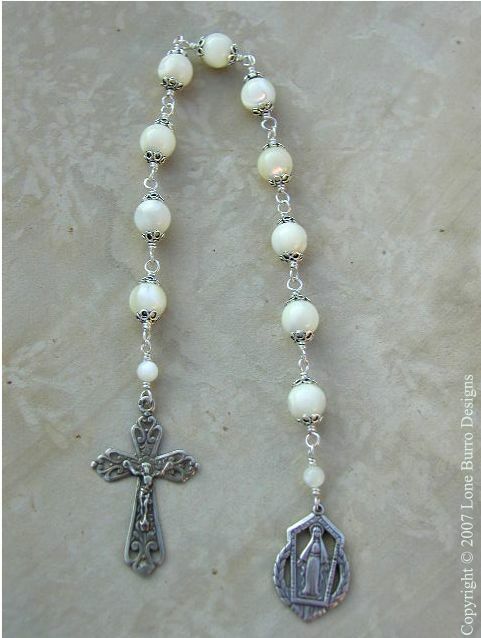 Made of 8mm white mother of pearl with sterling silver bead caps, Marian medal, and crucifix. This was another commission piece for a customer who wanted to give a special gift. 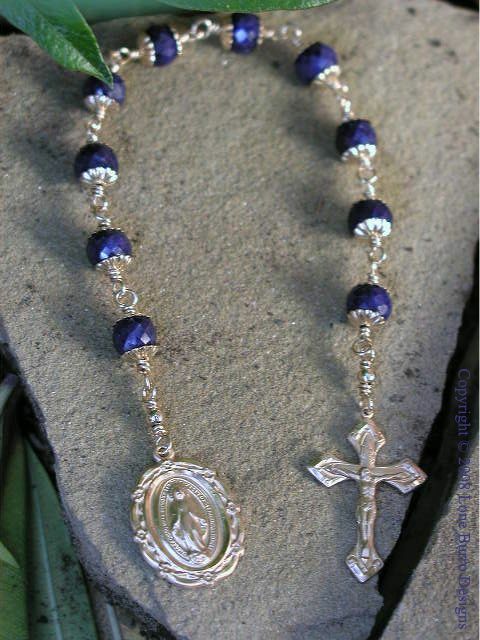 It is designed with large faceted genuine sapphire beads and 14K gold-fill links, medal, and crucifix. 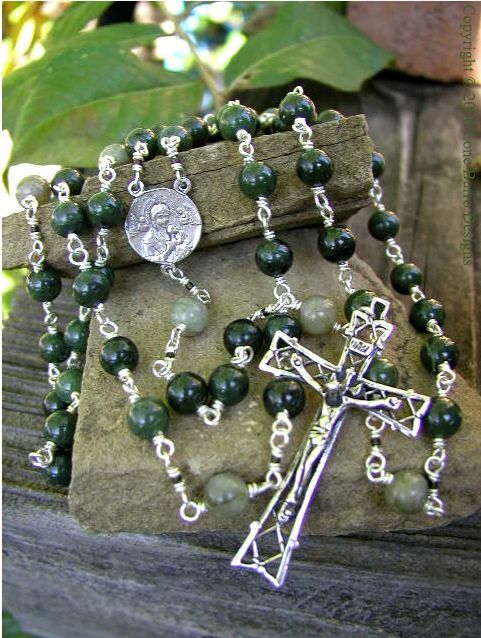 This is an update to the green jade rosary in the Gallery. The design is still simple with little extra adornment and features an Our Lady of Perpetual Help rosary center. The Paters however are a contrasting light mossy green labradorite, which also flashes with a subtle blue color in the right light. The entire design is in an 8mm range bead, suitable for men and women alike. I couldn't help displaying this wonderful rosary. 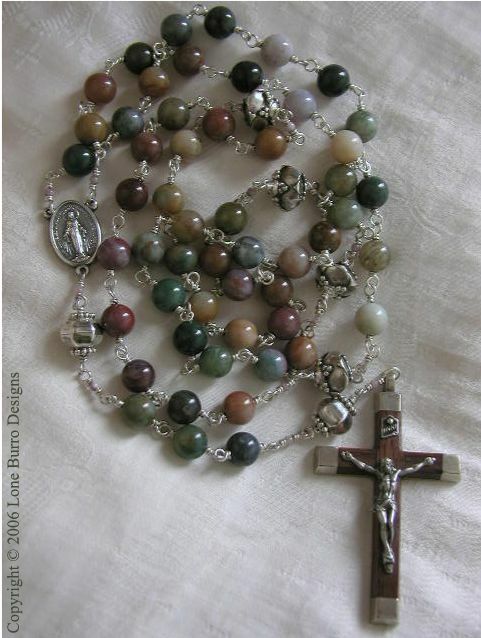 I had the honor of remaking this rosary, clipping away its old, tired wire links and replacing with new sterling wire-wrapped links. The connecting links were updated with tiny rounds of lepidolite. The beautiful sterling silver Paters were given a good cleaning to restore their brilliance.